Developer Dead Mage Game Studio was founded to develop engrossing fantasy action adventure games like “Garshasp: The Monster Slayer.” A few years ago, the studio shifted its focus to mobile games. On the heels of “Shadow Blade” comes “Epic of Kings,” a game that introduces deep combat with intuitive controls and an engaging storyline filled with adventuring and boss battles. Puya Dadgar, technical director at Dead Mage, talks about what’s in store for gamers who explore the mythological world of Khunirath in this exclusive interview. After the success of our pervious title “Shadow Blade”, we wanted to bring console quality video game experience to mobile devices. So, we gathered team of veteran console developers, and created a console game development pipeline. Early prototypes suggested that we will be able to bring most of the advance console graphics, and gameplay to the high end mobile devices. Years after the first war of the deities, in the torn lands of Khunirath, the once glorious warlords of the army of light were now lone mercenaries wandering the kingdoms in search for opportunities to practice their fading skills and survive. Conflict and chaos ruled the realms and the ashes of the first war turned into occasional fires between the humans and the Deevs that looked for opportunities to conquer the realms. The story of Epic of Kings follows the journey of one of the mercenary warlords on his mission where he will face much greater challenges and gets involved in epic adventures in the mythological fantasy world of Khunirath. 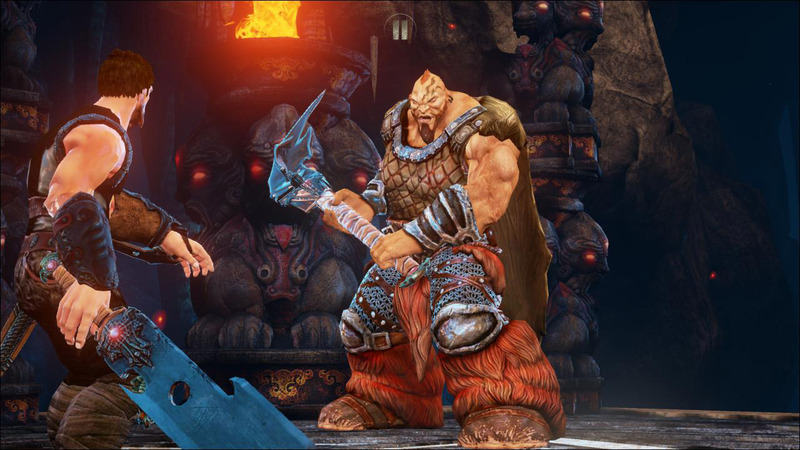 Besides the depth of the gameplay, story, characters and what player is enabled to do in these rich environments, “Epic of Kings” showcases advanced visual effects, and graphics. The game also offers high quality cinematic sequences for its storytelling. “Epic of Kings” offers unique, exciting, and breath-taking gameplay ranging from combat to pursuit sequence, and quick time events in a high quality real-time environment with visual effects rarely have seen on mobile games. The gameplay has been designed specifically for touch devices in order to give player console gaming experience on mobile devices. There have been a few attempts to create a console quality gaming for mobile devices. Each lacked part of it makes a great console game, with “Epic of Kings” we are excited about developing a game that pushes the quality of mobile games on all fronts. Based on our playable footage on Nvidia Shield tablet, so far we have managed to run very complex, console quality scenes, and gameplay on the device with a very reasonable frame rate. We had a very close collaboration with Nvidia, they have provided us with their new hardware, and that helped us a lot for optimization early on. They were also very supportive with any additional rendering tech needed for the game. They pushed for console quality effects such as Shadows for dynamic objects, advance post process effects, complex particles, and cloth simulation which some have been implemented in the game at the moment and the rest will be available for the final game. How does your game make use of the latest Tegra K1 technology? “Epic of Kings” runs advance postprocess effects like Blur, Depth of field on Tegra K1 smoothly. It also takes advantage of advanced lighting, real-time reflections, and HDR. With Tegra K1 we were able to have multiple complex particles in the scene running at the same time without any major performance hit. We had to optimize or cut some of the more advance effects for lower end devices. We tried hard to make impact on gameplay experience as minimal as possible, but graphically the game will have some differences on lower end devices in comparison to Tegra K1 powered devices. With Nvidia Tegra K1 technology, we will be able to take advantage of DirectX 11, and OpenGL 4.4 class features, which was previously only available for PC and high end consoles. Therefore, on mobile in terms of graphics, we are getting closer to quality of high end console games everyday. What do you see that opening up for game developers moving forward? I think the gap between mobile gaming and high quality console games are getting narrowed every day, and we would predict, that soon it would be hard to tell the difference between high quality mobile game, and a console title. What are your thoughts on the Nvidia Shield and Shield Tablet? When you are developing a game for NVIDIA Shield Tablet, it feels like in many aspects, you have all the freedom of developing a PC game.